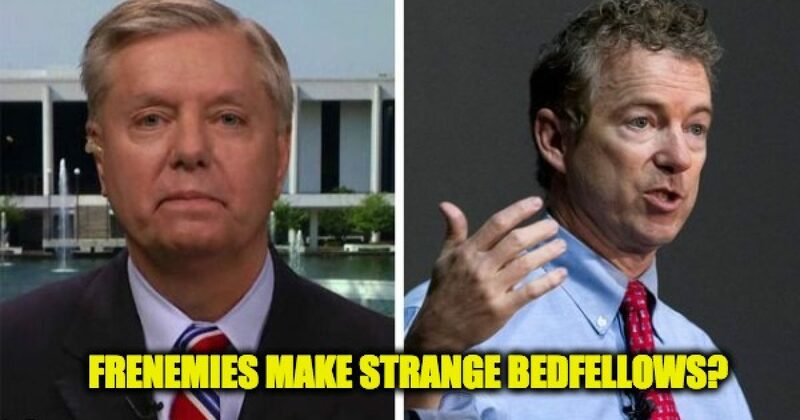 The phrase “politics makes strange bedfellows” is adapted from a line in Shakespeare’s play The Tempest, “Misery acquaints a man with strange bedfellows.” And when one considers the semantics, Misery may be the more appropriate term. However, a recent common enemy has the two men finding common ground in their efforts to protect our republic. On Sunday, Graham told NBC’s Meet the Press host Chuck Todd that we needed a special investigator (like Robert Mueller) to investigate political bias against President Trump and the GOP in the FBI. Here’s what one of the emails said, to Miss Lace he was writing. “I want to believe the path you threw out for consideration in Andy’s office, that there’s no way he gets election, but I’m afraid we can’t take that risk. It’s like an insurance policy in the unlikely you die before you’re 40”. This is the guy in charge of investigating Clinton, who called Trump an idiot. When you look at those emails, he had a political bias against Trump. But I want to know who was in, in was in Andy’s office. And I want to know did this FBI agent feel like he had to take the law in his own hands and create an insurance policy against an outcome of an election that he may not have liked. Todd: Do you think it was a political bias? How do you know it wasn’t something that he had found in his investigation? Mr. Comey told President Trump, “Here’s this dossier. It’s unverified.” I don’t think an informant for the F.B.I. should be taking the product and shopping it around to journalists throughout the world. The system doesn’t work that way. Let somebody other than Senator Graham look at this. I think Mr. Ohr had a conflict of interest if he worked with Mr. Steele, because his wife worked with Mr. Steele. And this F.B.I. agent that Mr. Mueller fired, the way he conducted the Clinton email investigation should scare us all. It could be Trump today, you tomorrow. So the F.B.I. needs to play by the rules too. I support Mr. Mueller, but somebody needs to look at the Department of Justice. Todd: Senator, you are painting, you are painting a picture of a lawless Department of Justice and a lawless F.B.I., totally filled with political partisanship. Do you really believe this? Graham: I believe that Mr. Strzok was a political hack. I believe that Mr. Ohr had a conflict of interest. His wife worked for the organization that produced the dossier. And if he interacted with Mr. Steele, that is wrong. I believe Mr. Mueller fired Mr. Strzok for a reason. But that’s not the end of the inquiry. I believe there’s plenty of evidence that the Russians interacted with the Trump campaign and Mr. Mueller’s going to get to the bottom of it. The F.B.I. is a great organization. But no organization is subject, can’t be looked at. If you’re not worried about Mr. Strzok being in charge of the Clinton email investigation, given his attitude toward the Clintons and Trump and what he said, then I think you’re blind to the fact that this whole, this whole investigation needs to be looked at independently. While Graham was appearing on NBC, Senator Paul was making an appearance on CBS’ Face the Nation where he was making a similar argument to host John Dickerson. Paul told Dickerson that the men and women working in our intelligence community are not infallible and as such should not be trusted with the overwhelming spying powers that we’ve given them through the FISA process. The reason we need more oversight is that people — as Madison said, men are not angels. And we have seen recently how we have had some people in the FBI that had a bias against the president. We also have seen now people in the Department of Justice who were married to people that were doing opposition research on Trump. So, you can see how people are human, and bias could enter into this. And the history of the CIA and the FBI are not without blemish. The Hoover years are a great tarnish. We also had civil rights activists in the 60s illegally spied upon. We had Vietnam protesters illegally spied upon. And we had this great to-do, the Church Commission, back in the 70s. And FISA was supposed to rein that in. But now many of us, Senator Wyden and I have, in a bipartisan way, looked at this and said, my goodness, we have to defend the Americans’ right to privacy. And right now, we’re sort of a minority in the Senate. In the House, though, it’s close to 50-50. What is most interesting about this is that Senator Graham is actually one of the legislators who will stand up and defend the intelligence community and argue that they should have more spying power not less. Meanwhile, he is openly admitting that the agencies in question may actually be rife with corruption. So while Paul and Graham seem to have found common ground on this issue, their alliance is likely short-lived. But the pertinent thing is that both men recognize and argue that the FBI and the DOJ seem to have been compromised by partisan hackery, and both organizations need to be investigated and reformed.